Succédant à Rob Letterman, Ari Sandel livre un suspense peu haletant, qui expose cruellement les limites de la franchise. It should please younger fans of the books who will have no problem with its rudimentary storyline all too repetitive of the original. 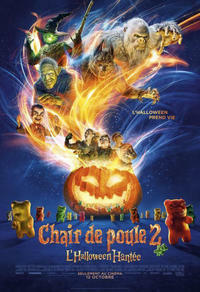 Goosebumps 2: Haunted Halloween will please children to no end, provided they haven't started graduating to the world of any horror films with ratings of PG-13 or above. This "Haunted Halloween" is something of a letdown after its sleeper-hit predecessor, but Wendi McLendon-Covey steals the show. The movie feels undercooked on every level.